Limited Spaces Available! For reservations call (877) 631-9323. Spaces are extremely limited this time of year so book early to ensure the date you want. Come experience our upscale catamaran sailing and Wild Dolphin Encounter. Enjoy a smaller group for a better experience. 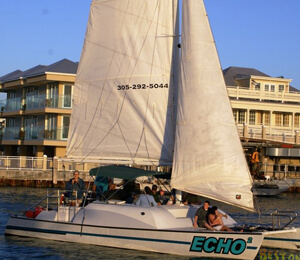 The Echo2 (the only wild dolphin trip in Key West on a sailing catamaran) is certified to carry 28 passengers, but as part of our quality control this trip is kept at half capacity! Take this exclusive tour and enjoy a wild and natural dolphin encounter, as well as an hour and a half of snorkeling time and some great sailing too. We sail the shallow tropical waters around the deserted islands off Key West and in the National Wildlife Refuge. Our second stop is to enjoy some of that famous Key West snorkeling. We love to snorkel our favorite shallow water shipwreck encrusted into a coral reef. We also go to other wrecks, coral reefs, and sponge garden environments. We sometimes even make a stop on an awash, isolated sandbar. Because we are a catamaran, we can go wherever it is best to go that day. We know all the secret spots in the shallow waters off Key West and can take you to the places that other boats only wish they could go. We pride ourselves in providing the best wild dolphin encounter with the Wild Dolphin Sail and Snorkel Adventure! Jump overboard and enjoy some of the best snorkeling in Key West or relax and watch the sea life and snorkelers from our soft trampoline sun deck or from our comfortable shaded seating area. Cool off with a fresh water shower after a salty snorkel. Sit back and enjoy our premium tropical fruit tray and assorted snacks and nuts. We also provide you with ice cold soft drinks, bottled spring water, domestic and imported beers including Miller Lite, Corona, and Heineken, and our two excellent house wines, McWilliams Chardonnay and Shiraz. Then you cruise back to Key West while relaxing and enjoying memories you can only get on the tropical waters of the Florida Keys. Snorkeling locations will vary day by day according to current conditions. We will always sail to the best locations possible! Dolphins Key West is always interested in your tour experience with us. We hope you enjoyed your tour and love to hear comments. I have been to the Bahamas many times, but Wild Dolphin Sail and Snorkel Adventure is one of my favorite trips! It includes everything that everyone should do here. As a Bahamas veteran, I can say only the best about this experience!